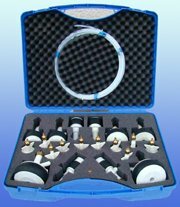 Orbimatic GmbH has added the ORBIPURGE internal purging kit to their range of high quality orbital welding equipment. The ORBIPURGE kit is an ideal partner for the ORB1001 low level Oxygen Analyser which gives a high quality internal purging system. The ORBIPURGE kit is supplied in a tough ABS case with a profiled foam insert for location of each purge plug. A range of plugs are included from 0.5” to 4” are supplied to cover most applications. Each plug is fitted with a quick release gas connector for ease of use. The ORBIPURE kit also includes a gas input hose which is fitted with a quick connect fitting for attaching the plugs. To give a complete orbital welding and purging system the ORB1001 & ORBIPURGE kit can be combined with the highly advanced ORBMAT C Orbital Welding Power Supplies. The ORB1001 can be interfaced to the ORBIMAT C power supply and the welding cycle will be disabled until the internal gas quality is suitably pure. Viking Pump’s Lid-Ease® strainers are specially designed to protect any pumping system by preventing solids or foreign materials from entering the pump. As a result, pumps and downstream process equipment experience fewer repairs, reduced downtime, and longer life. Several features of Viking’s Lid-Ease strainers ensure reliable performance and maximum pump uptime. For example, high differential pressures are accommodated by a perforated stainless steel basket with maximum hoop strength which supports an inner stainless steel screen. Differential pressure indicators that show when the basket needs to be cleaned are optional. To stop entrained solids and foreign materials, the strainer basket comes in numerous options from 10 to 100 mesh screens, or no screen (basket openings 0.188" dia.). The basket can include optional magnetic inserts for trapping ferrous particles. Also, maintenance is made trouble-free by a breech lock lid that enables simple top removal of the basket for cleaning. Lid-Ease strainers come in three port options: grooved, tapped, and flanged. In addition, several materials of construction are available for the strainer, including aluminum, cast iron, ductile iron, and stainless steel. All baskets are made of 304 or 316 stainless steel. Capacities range from 20 to 1,500 gpm. Honeywell Sensing and Control announces a convenient hand-held vibration meter from its Sensotec Test and Measurement business. The portable, battery-powered Model VM from Honeywell Sensotec, Columbus, Ohio, enables engineers to prevent damage to components or bearings by monitoring machine vibration. Placing the probe directly on the vibration point and comparing two successive readings indicates when vibration is increasing to unacceptable levels. Users can select peak (VM110) or peak to peak (VM120) and rms measurements of acceleration, velocity, and displacement. Respective ranges for the three measurements are 2, 20, and 200 g; 2, 20, and 200"/sec; and 2 20, and 200 thou, respectively. Accuracies are 1.5% rms, 3% peak; 2.5% rms, 4% peak; and 3.5% rms, 5% peak, respectively. A low-pass filter selector removes signal noise. The LCD display provides 3 readings/s. General Monitors announces the advanced TS4000 Intelligent Toxic Gas Detector, a microprocessor-based transmitter designed to monitor toxic gases or oxygen deficiency and provide status indication and alarm outputs. The TS4000 offers many sophisticated features, including long distance remote mounting up to 2,000 feet, dual redundant MODBUS communications, 8 amp relays, three-digit display, 4-20mA output, and indication of remaining sensor life. All of the electronics are contained within an explosion-proof housing so that sensor information can be processed at the sensor site. Additionally, the interface module’s galvanically isolated, intrinsically safe design supports sensor field replacement without special tools or hot work permits. This unit features one person calibration and can virtually self-calibrate by activating a magnetic switch and applying gas. It monitors a variety of toxic gases in the parts per million (ppm) range, including: ammonia, carbon monoxide, chlorine, chlorine dioxide, hydrogen chloride, nitric oxide, nitrogen dioxide, oxygen deficiency, ozone, and sulfur dioxide. The TS4000 utilizes an intelligent microprocessor-based design in an explosion-proof housing. 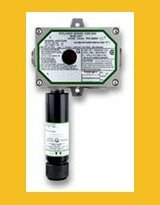 This 24 VDC-powered toxic gas detector is comprised of a base unit, sensor housing with interface module and electrochemical sensor. Its powerful capabilities complement General Monitors’ existing toxic gas detection series, joining the TS400 Toxic Gas Detector, TS420 Oxygen Deficiency Detector, IR7000 IR Carbon Dioxide Point Detector, MC600 Multi-Channel Controller and TA502A Trip Amplifier. 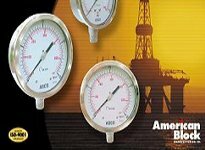 American Block Mfg of Houston, Texas has introduced two of their new products - Hammer Union and Pressure gauges. As one of the authorized repair facilities in Houston for Nabors and Key drilling companies, they have expanded their repair services for Rotary Tables, Mud Pumps, Travelling Blocks (upto 1000 tons. The new products will provide the diversity in the ABCO product mix to increase their volume sales in the year 2004. 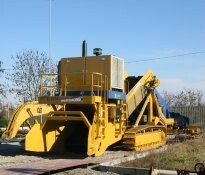 CRC-Evans can now provide a broad range of ditch padding equipment, including vibrating screen machines and crushing machines. These include the Selfloading Superscreen is the newest generation of selfloading padder. It’s self-propelled and self-loading, which reduces equipment and manpower needs, and features a hydraulic drive with the flexibility of increasing or decreasing loading speed. The high-frequency vibrating screen has a vibrating surface of 5.4 square meters, which ensures high output and improves performance with damp materials. Operates with remote control for added safety in padding operation and in loading for transport. 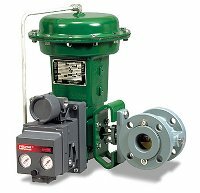 Neptune Chemical Pump Co. Inc has added new liquid-end options to its line of Series PZ Electronic Diaphragm pumps. In addition to the original PVC and Acrylic models, Kynar (PVDF) and 316ss liquid ends. 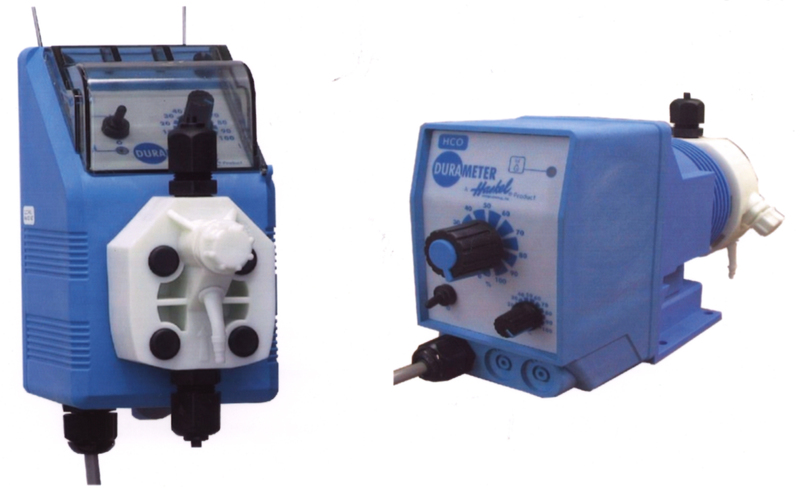 The series PZ pulse metering pump is ideal for accurate, reliable injection of a wide range of liquid materials, including chemicals, nutrients and disinfectants. Kynar (PVDF) models are available with choice of EPDM, Viton, or Teflon seals. Stainless steel liquid ends have DPDM seals as standard; other seals are available by special order. 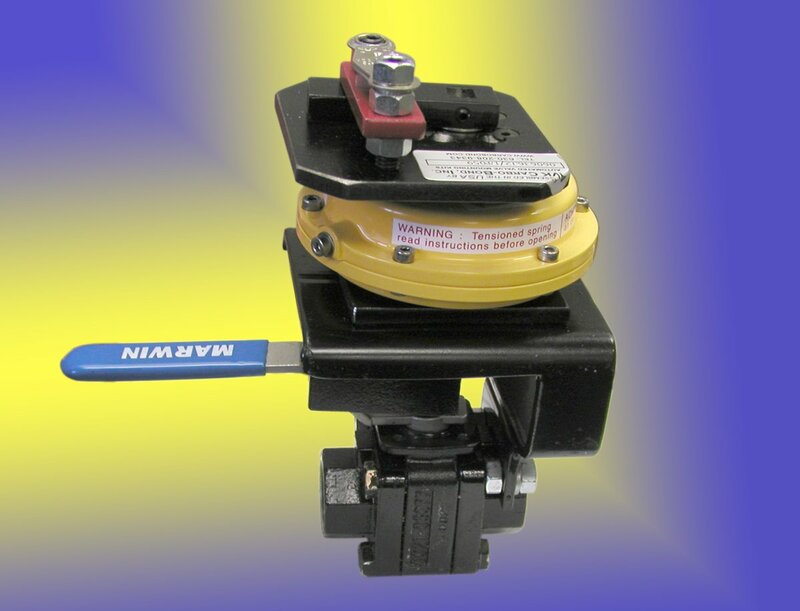 Marwin Valve introduces an improved, heavy duty fusible link assembly for the 3000 series. The 3000 series Fusible Link Assembly now features an improved, space saving design, utilizing a cam placed on top of the spring pack rather than a fixed loaded arm. This design can be used as a standard manually operated valve as well as a spring loaded fusible link actuated valve, potentialy eliminating extra valves. Fusible link valves spring closed or open when high temperature heat from a fire causes a fusible link to break. The most common application is to fail close to shut off the flow of flammable liquids or gases during a fire. They are also used as fail open valves to allow the flow of water, or fire extinguishing chemical in fire suppression systems. 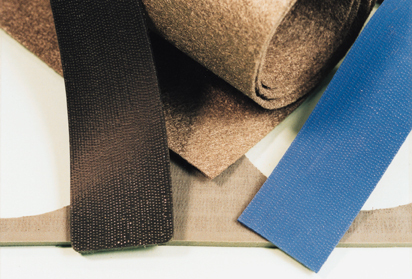 Holland Shielding Systems BV has developed a new shielding material known as Flatshield 5700. It is a composite gasket material consisting of a larte number of small wires embedded and bonded in solid or sponge silicone, or fluor silicone elastomer for oil-resistance. Flatshield 5700 is used in military, industrial and commercial products requiring EMI suppression, grounding, or static discharge. It is very suitable for applications where an environmental or pressure seal is required and where loose wire fragments could cause severe damage. The sponge version is used in cases of severe joint uneveness, or if lower closure forces or greater compressability are required. Specifications: temperature up to 220 Degrees Centigrade; water sealing up to 10m of water; pressure resistant; salt spray/chemical resistant; fluor-silicone rubber for fuel/oil-resistance; supplied as sheets, strips or die-cuts. 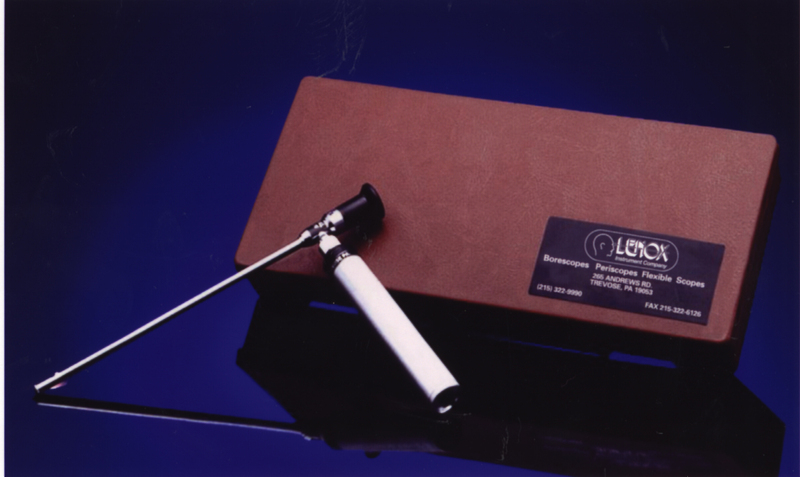 The AUTOSCOPE from Lenox Instrument Co. is ideal for inspection of any fixed-wing aircraft reciprocating engine. Teledyne Continental specifically recommends the unit in its Service Bulletin SB03-3 which details borescope inspection for a wide range of maintenance protocols, including inspection of internal cylinder surfaces, the combustion chamber, exhaust/intake valve faces, cylinder bores, and piston heads. The AUTOSCOPE is a very affordable, portable, battery-powered borescope for individuals and organizations involved with servicing of aviation, automotive, truck and marine engines. This handheld optical diagnostic tool lets mechanics inspect diesel and gasoline engine combustion chambers, valves, carburetors, radiators, and body panels without major disassembly, giving them a bright, clear magnified image of existing or potential problems. 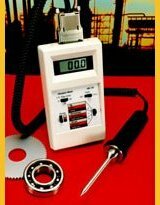 The units have also been used as an inspection tool in thousands of industrial applications worldwide. The AUTOSCOPE provides a probe diameter of either 6 mm or 8 mm, field of view of 70 degrees, focus from 1/4 in. to infinity, and working lengths of 9 inches to 15 inches. An optional angled viewer accessory is available at modest cost. The complete visual diagnostic kit includes eyepiece and probe with internal lens and light system, battery pack, battery extension cord and storage/carrying case. Two new solenoid metering pumps has been introduced by Haskel International for low pressure, low flow applications Applications for HTA solenoid metering pumps include wastewater treatment, cooling water, boiler treatment, municipal water and swimming pools, among others. Users of the company's existing EV series of hydraulic actuated diaphragm metering pumps will now be able to take advantage of a single source for sales and service. The compact, wall-mountable HTA 1 pump (maximum discharge pressure 170 psig) is adjustable with a single dial to control stroke speed. The larger HTA 2 pump (maximum discharge pressure 260 psig) allows adjustment to stroke length as well as speed. Both are suitable for automated operation and include priming and check valves for efficient self-priming with no need for external valves. Standard head material is chemical resistant polypropylene for most common applications. Optional PVDF and stainless steel wetted ends allow the pumps to be configured for a wide range of uses. Each pump is supplied ready for installation with tubing, foot valve, injection valve and an owner's manual. From seismic interpretation to reservoir simulation the industry is challenged to reduce project cycle-time while maintaining a consistent and accurate representation of the earth's subsurface. 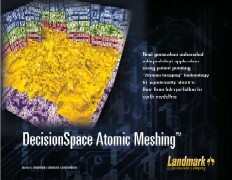 Leveraging simple image processing techniques, DecisionSpace™ Atomic Meshing™ from Landmark automatically aligns a lattice of points (atoms) with horizons and faults in a seismic volume image. Connecting the atoms yields an unstructured space-filling polyhedral mesh, or atomic mesh. Alignment of the polyhedral mesh with both faults and horizons automatically creates a sealed model. The long-term vision is for the polyhedral mesh to support semi-automated seismic interpretation, structural framework building for input to DecisionSpace PowerModel™ 3-D grid generation, property modeling, and flow simulation. In the next few years Landmark will truly close the "seismic-to-simulation" loop by enabling a complete geoscience and engineering workflow using Atomic Meshing. The first release of Atomic Meshing will focus on tools for data preparation, meshing and interpreting the mesh. Subsequent releases will address property modeling and completing the workflow through reservoir simulation. The complete "seismic-to-simulation" workflow will be exponentially faster than current workflows requiring many different surface and model representations. Your interpreters, geologists and reservoir engineers will maximize the value of subsurface G&G data, and see improved accuracy of the earth model and flow simulation results. The common data model offered by DecisionSpace Atomic Meshing will be particularly effective where rapid earth model updates are required for input to multiple reservoir simulations. Parker Instrumentation has launched a new instrumentation check valve which is optimised for reliable operation at extreme temperatures, and high pressures. High integrity is assured by means of a metal seat, allowing safe operation over an extended temperature range from -148 to +482ºC, and at pressures up to 6,000PSI CWP (-100 to +900ºF, up to 413 bar). Fabricated in 316 stainless steel, Parker's LC Series of lift check valves are available in 1/8, 1/4 and 1/2 inch sizes. Users may also specify the valves for compatibility with existing systems or preferred installation practices by choosing from integrated single (CPI) or twin (A-LOK) ferrule compression tube fittings, or female NPT pipe thread connections. The forged body is very compact, and spans only 5.1cm/2inches in its smallest 1/8 inch implementation. 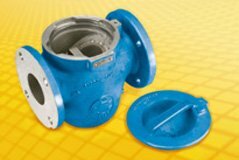 The new metal-seated check valve is ideal for liquid service applications, and provides a simple means of adding protection in any system where back flow or pressure might cause a problem or damage. 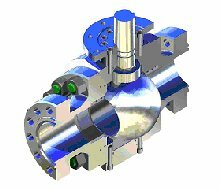 The LC Series employs back pressure and a gravity-assisted poppet to achieve a seal, and prevent flow in the reverse direction to within 99.9% of forward flow. The high environmental specification of the LC Series makes the valves a safe option for handling the temperature extremes found inside power generation, petrochemical, and chemical processing plants, within oil and gas transmission facilities, and on laboratory test and evaluation equipment Typical applications include equipment where back flow can cause contamination, such as analytical instrumentation, and on equipment which can be damaged by back flow, such as pumping systems. Servomex Group has replaced its successful 1100A type paramagnetic oxygen analyser which had been in production for the last 2 decades. The 1100 is to be phased out from the end of September 2003, and it is replaced by the already well established 2200 paramagnetic oxygen analyser, launched during 2001. The 1100 model's long life is, according to the Servomex Marketing team, the result of the new ATEX hazardous area regulations, which came into force on July 1st. The only exception is the 1100H, which provides oxygen analysis at 110 degrees centigrade for use with gas streams where there is a very high dewpoint. Production of the 1100H will continue until after the successful launch of the 2200H. Withdrawal of the 1100H is not expected before the end of 2004. Honeywell Sensotec has launched its plug, play and calibrate systems for its sensors and signal conditioning. The system is compliant to IEEE 1451.4 standard for connectivity of sensors and associated signal conditioning. The transducer electronic data sheet (T.E.D.S) containing sensor specifications, calibration data and user defined location information is stored in the sensor. When connected to the SC2000 or any IEEE 1451.4 compliant signal conditioning the sensor is interrogated for the TEDS information and automatically sets up and calibrates the signal conditioning with the sensor. IEEE 1451.4 compliant sensors and systems are set to revolutionise the test and measurement market. Users will never have to search for sensor calibration data sheets nor worry about the identity of blind cable and connectors. The data will be right there stored in the sensor and automatically recognised when the signal conditioning is powered up. Chandler Engineering offers the Gas Chromatograph, providing fast and accurate testing for your samples with a large selection of affordable pre-tested applications. You can select FID or TCD detectors or use them in combination. Multi-component analysis, microprocessor-based valve programming controller, and continuing technical support are always included. Use the Carle for Refinery Gas Analysis, Corrosive Gas Analysis, Natural Gas Analysis, Hydrogen Product Gas Analysis, Stack Gas Analysis, Permanent Gas Analysis, Trace CO2, CO & Methane Analysis. 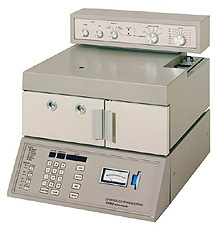 The Carle Series 100 is a highly reproducible, affordable instrument designed for educational institutions or small industrial labs as a basic isothermal gas chromatograph. With its simplicity of design, the Carle Series 100 AGC is easy to operate for a first-time user, yet delivers the performance demanded by the experienced chromatographer. The Carle Series 100 offers easy-to-set temperature and superior Isothermal Temperature Control (stable to +/- 0.01°C). The Series 400's Multi-column/Multi-valve allows you to analyze complex samples previously requiring several traditional GC's, thus reducing analysis time and extending column life. Full documentation is included on the valving and column system, operating parameters, temperatures, flow rates and valve switching program backed by an actual test chromatogram run on your instrument. New for 2003 Alco launches its long awaited “TB” Trunnion Valve Range. The range starts at ½” bore and goes up to 12” full bore. Pressure ranges from 600lbs to API 10,000 with various flange or hub end options to choose from. Also the option for soft or metal-to-metal seats is available. 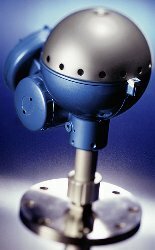 Other features include a safer body design with only one body Joint, a truly balanced ball sat between two equal trunnions which reduces uneven loading which in turn reduces wear, advanced sealing technology is used at the critical end flange and stem areas, metal to metal ball and seats for abrasive or high temperature services and a standard ISO5211 mounting pad and top works for gearbox or actuator interface. Materials of construction include stainless steel, Duplex, 6mo and LF2 and various super alloys. Emerson Introduces the FIELDVUE® Remote Mounted DVC6005 (HART®) Digital Valve Controller. Emerson Process Management has made it possible to remotely mount a FIELDVUE Digital Valve Controller and digitally monitor the performance of control valves in severe-service or tight-fit applications. Fisher's DVC6005 (HART) instrument is an extension of its DVC6000 Series of Digital Valve Controllers, which are direct-mounted to a control valve. 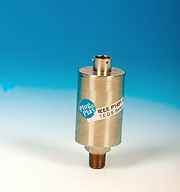 With the DVC6005, however, the valve position feedback potentiometer is mounted on the control valve, but the remainder of the instrument's components are mounted on a pipe stand or wall - as far as 100 feet away from the valve.The remote-mount option is ideal for applications in which high-temperatures (up to 250-degrees Fahrenheit), vibration, or limited space make traditional installation difficult or impractical. Manufacturers including those in the Pulp & Paper or Nuclear Power industries may prefer to isolate DVC components (such as the I/P, relay, and electronics) from harsh or hazardous areas.Fisher has developed thousands of mounting kits to remotely apply the DVC6005 instrument to sliding, rotary, and quarter-turn actuators; the smaller-size Baumann valves; as well as many other valves. Fisher maintains a library of the various mounting kits available and has created an internal web-site for its worldwide sales Representatives to aid them in kit selection. Emerson's Asia Pacific sales team submitted the first order for the Remote Mounted DVC6005 and has supplied 40 units to a nuclear power customer in Taiwan. The Rosemount 5600 Series is a powerful, non-contact radar level measurement transmitter for process applications, on liquids and slurries. 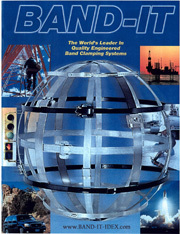 The unit is available with a full range of antennas to suit any application. Smart FMCW echo-tracking features and advanced signal processing techniques combine to give the 5600 high realibility and accuracy, even in the toughest conditions. The Rosemount 5600 accumulated in thousands of radar installations around the world to discriminate between false echo sources and true surface echoes. This software can also use information provided by the operator about stirrers or other obstructions as a complement to the automatically collected data. The Rosemount 5600 integrates with PlantWeb digital plant architecture and can provide HART and FoundationTM fieldbus digital communications protocols, or a standard analog output. For local monitoring, the unit has an integral display and keypads for basic initial configuration. Remote displays and as many as six eternally mounted temperature sensors can be driven from the Rosemount 5600 transmitter. The Rosemount 5600 brings the best in radar level gauging technology - accuracy, reliability, no liquid contact, no moving parts - with full industrial control interfacing. NDT Systems & Services AG is pleased to announce that their new generation of high resolution ultrasonic in-line inspection tools is now commercially available. 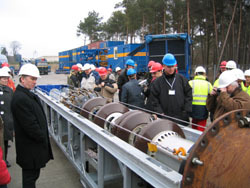 The new tool was introduced to a selected group of customers during a demonstration run performed in a test pipeline at the premises of Weatherford-Kopp in Lingen, Germany. The pipeline was specially prepared with artificial defects simulating corrosion as well as cracks. The tool performed two separate runs. First the tool was configured as a crack detection tool utilizing a sensor carrier incorporating angled beam probes for crack detection. After the intial run the tool was then configured as a crack detection tool, a simple and fast process which only requires the change of the sensor carrier to a design using right angled probes. The run was then repeated. Subsequently the data recorded was downloaded and presented to the visitors. The high resolution ultrasonic tool presented by NDT Systems & Services represents a new generation of technology. The electronics of the tool have been specifically designed to enable metal loss and crack detection surveys to be performed with the same tool, potentially offering huge cost savings in mob and demob costs. Agilent Technologies' analyzers for the hydrocarbon processing industry incorporate our extensive industry expertise in creating application-specific measurement solutions. We offer turnkey configurations for gas chromatographic analysis, including instrumentation, methods, supplies and service. The monomer analyzer featured here is a 6890N gas chromatograph plus a 5973N mass spectrometer with standard or customized subsystems and software configured to measure impurities in polymer-grade monomers such as ethylene and propylene. Producers of high purity monomers such as ethylene, propylene, and 1,3-butadiene face stiff competition and increasingly tight customer specifications. The monomer impurity analyzers are called on to test for more and more impurities at lower and lower detection limits, as buyers of these chemicals utilize more selective and sensitive polymerization catalysts. With the catalysts' susceptibility to poisoning and contamination, and the high cost of catalyst replacement and plant down time, impurity analysis becomes critical. Chromatographs used for impurity analysis often carry the heaviest sample loads because of the information they produce. This system incorporates: A Mass Selective Detector (MSD) used to detect trace impurities to the low ppb level. Such trace impurities include: arsine, phosphine, oxygenates, and sulfur compounds. A Pulsed Discharge Helium Ionization Detector (PDHID) used to detect oxygen, nitrogen, and hydrogen to the low ppb level. A Vaporizer used for the non-discriminating, repeatable conversion of liquid propylene to gas phase prior to injection. Agilent Technologies have broad expertise in these analyses, and extensive experience in valved gas chromatography, with standard and customized configurations.